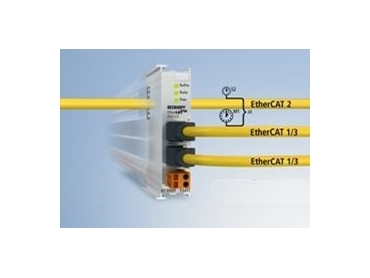 The EtherCAT Industrial Ethernet system offers better performance and highly flexible topology characteristics. In complex machines and systems with several EtherCAT masters, data may have to be exchanged between individual EtherCAT systems or the distributed clocks of different systems may have to be synchronised. A suitable solution for these applications, the new EL6692 bridge terminal for the Beckhoff EtherCAT terminal system implements these tasks directly in the I/O system. The EtherCAT masters such as the TwinCAT automation software suite from BECKHOFF Automation can exchange data in real-time through network variables. The EL6692 EtherCAT bridge terminal optionally provides this functionality directly in the I/O system. In addition to ‘normal’ data exchange, the EtherCAT bridge permits distributed clock synchronisation (exact calibration of distributed clocks) between several EtherCAT masters, for example, in exact drive synchronisation in spatially distributed machines. In addition, the EtherCAT bridge terminal can integrate subordinate PCs – e.g. Beckhoff Embedded PCs from the CX series – as EtherCAT slaves in an EtherCAT network. In this case, the bridge terminal of the CX system is coupled with the higher-level EtherCAT system. The EL6692 bridge terminals have a separate power supply for both EtherCAT networks in order to prevent an interruption of data communication due to power loss in one of the systems. The EtherCAT Terminal system is a modular I/O system consisting of high-performance, electronic terminal blocks. The EtherCAT protocol is maintained into the individual terminal permitting ultra fast communication speeds. High-performance EtherCAT Terminals are available for all common digital and analogue signal types encountered in the world of automation. Fieldbus devices, e.g. for PROFIBUS, PROFINET, CANopen, DeviceNet, Interbus or Lightbus, are integrated through local fieldbus master/slave terminals. Any standard Ethernet device can be integrated locally through switch terminals.